Tag line: "What the dickens have they done to Scrooge?... They've put him in a big, big musical"
Now that December is upon us, I thought I’d ease my way into the Holiday season by reviewing a few of the cinematic incarnations of Charles Dickens’ Yuletide masterpiece, A Christmas Carol. 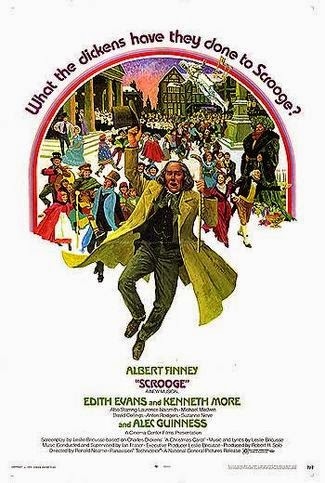 Having already covered the two best versions of the story (1951’s A Christmas Carol and its 1984 made-for-TV counterpart) as well as the funniest (Blackadder’s Christmas Carol), I figured I’d try my luck with a musical adaptation, which led me to 1970’s Scrooge. Its song and dance numbers aside, the basic premise of Scrooge is pretty much the same: Ebenezer Scrooge (Albert Finney), who operates a successful moneylending business in the heart of London, is a miserable old skinflint who hates everyone and everything, including Christmas. To help him change his ways, the ghost of his former associate, Jacob Marley (Sir Alec Guinness), pays Scrooge a visit on Christmas Eve to tell him that three spirits, the ghosts of Christmas Past (Dame Edith Evans), Present (Kenneth More), and Future (Paddy Stone), will be stopping by during the night. Hopefully, these supernatural visitations will rekindle Scrooge’s long-dormant Christmas Spirit, but at the very least, they'll show the old penny pincher that all the money in the world won’t save him should he refuse to reform. The usual cast of characters is on hand, including Scrooge’s long-suffering employee Bob Cratchit (David Collings) and his son Tiny Tim (Richard Beaumont); Scrooge’s kindly nephew Fred (Michael Medwin); and, during his journey to the past, the old miser’s former employer Fezziwig (Laurence Naismith) and his long-lost love Isabel (Suzanne Neve). Yet what makes Scrooge a success isn’t its adherence to Dickens’ tale, but the liberties it takes with it, starting with Finney’s performance, which, though unsettling at first (what with his hunched back and unusual way of talking), proves to be one of the most interesting takes on the character I’ve ever seen. In addition, some of the story’s key moments are handled a bit differently, including Marley’s visit to Scrooge (in a stunning sequence, both characters glide through the air, surrounded by the spirits of those who share Marley’s fate) and Scrooge’s trip to the future (which contains the best scene in the entire film, when Scrooge mistakes a public rally outside his office as a show of affection, never once realizing the actual reason everyone is celebrating). There’s even an extended sequence where Scrooge experiences what “life after death” might have in store for him. The most jarring change, however, occurs in the movie’s finale, a grand and glorious musical number that wraps up this particular version of Dickens’ classic tale in perfect fashion. While the music is mediocre at best (the two exceptions being “December the 25th”, sung during the Christmas party at old man Fezziwig’s; and the extremely catchy “Thank You Very Much”, performed several times throughout the movie, but initially at the above-mentioned rally outside Scrooge’s business), Scrooge has plenty of personality, and in the end puts a very satisfying spin on a time-honored tale. Nice review my friend. Remains my personal favorite take on the old story for many of the reasons you listed. The actual sequence when he wakes up in hell was edited down after early VHS versions for being too scary.